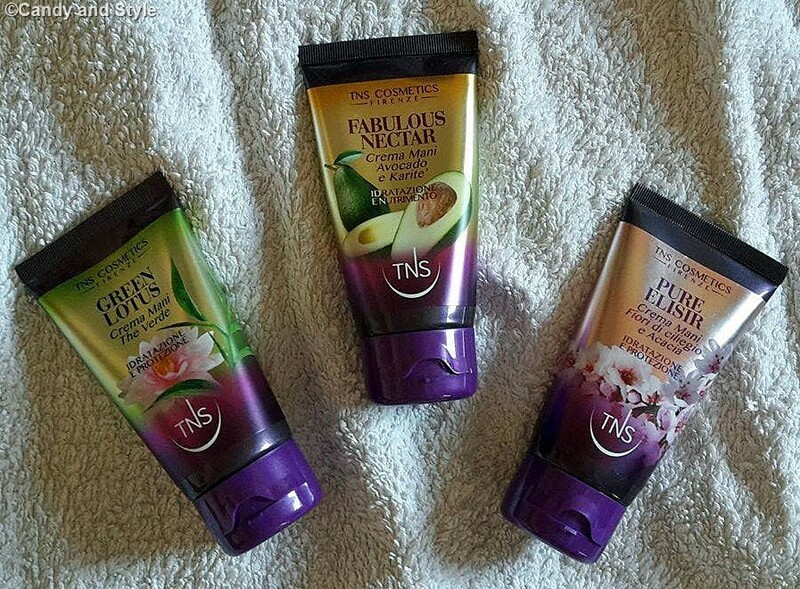 I'm here again to talk about TNS Cosmetics. 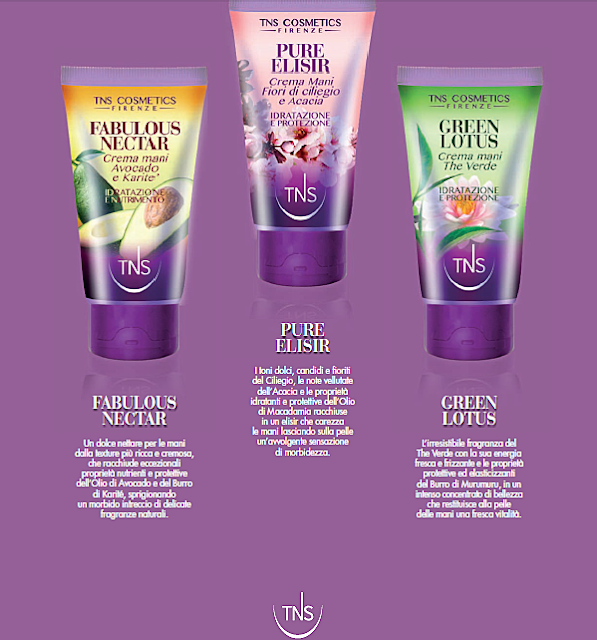 This time, the well-known Italian brand created a new collection, Hand Cream, a special line of 3 hand creams specifically thought for the care and beauty of hands: Green Lotus, Fabulous Nectar and Pure Elisir. Each of them have a delicate fragrance and different active ingredients that guarantee an amazing nourishment: Green Lotus is enriched with Macadamia Oil, Shea Butter and Murumuru Butter; Fabulous Nectar with Avocado Oil and Shea Butter; Pure Elisir with Macadamia Oil and Shea Butter. They all have a silky and smooth texture; they are very hydrating and fast absorbing, in few minutes the hands are perfectly moisturized and protected against the cold damages. Most important, their formula is free of parabens, paraffin and petrolatum. I would like to try this cuty things. Package is amazing! non potrei vivere senza crema x le mani.... interessanti queste profumazioni!!! Il packaging di questi prodotti è bellissimo, immagino che anche le creme siano ottime! Ludo...e queste meraviglie? !Mi piace già il packaging...sono incuriosita da quella ai fiori di ciliegio. I will take silky anytime. Can we say YES to the packaging? In inverno è praticamente indispensabile! ciao Ludo io non posso stare senza crema per le mani..ne porto ovunque vada..
in inverno uso spesso la crema per le mani, queste sembrano ottime, soprattutto le profumazioni! 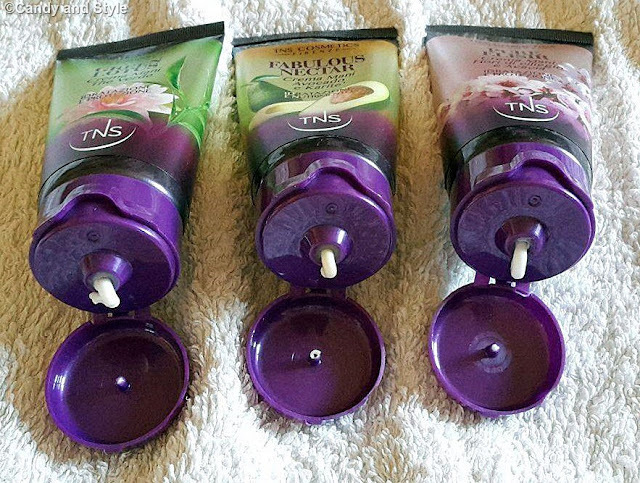 I can't be without hand creams, my hands are generally very dry so they are a must have for me. I don't think we get this brand in Canada but it's good to know you love it, Lilli! Those hand creams look so good, I really like the packaging and the vibrant colors! Moisturising hands in winter is crucial! Currently I'm loving the L'Occitane hand creams ( they smell heavenly! 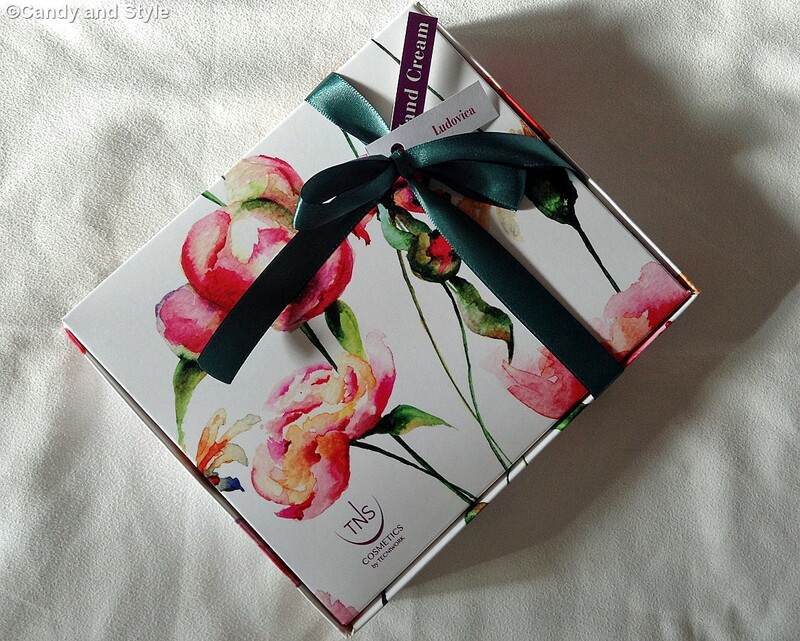 ), you should definitely try one with Neroli & Orchidee - I think you'll love it! I have never heard of this brand and I wonder if I can find it here in Canada. They all sound so amazing and that they would smell amazing! In this cold weather I definitely need these! Hand creams are a must for this time of the year! I would try the avocado one (as I have been eating avocados every day now, haha). Ciao Lilli. Non sapevo che questo brand avesse anche una linea di prodotti per la pelle. Queste creme mani le proverei tutte, soprattutto quella avocado e karitè. Hi Lilli! For me it is essential to carry in my bag a good hand cream, especially now that summer is coming and it is important to keep the skin hydrated, I like the design of the product and its components sound interesting!Kisses. The scents alone are enough to draw you in. The sound heavenly, both on the nose and on the skin.